In the 11 Most Useful Types of Miniatures, I lamented the lack of translucent miniatures for fire, water, and air elementals. I have discovered that the early Dungeons & Dragons miniatures sculpts for the medium-sized elementals reappeared in a HeroScape set called Fury of the Primordials. Unlike the original, opaque versions of these figures, the new versions come in translucent plastic. This makes the fire and water elementals look terrific, and the air elemental now looks like an air elemental rather than an angry, melting fish. 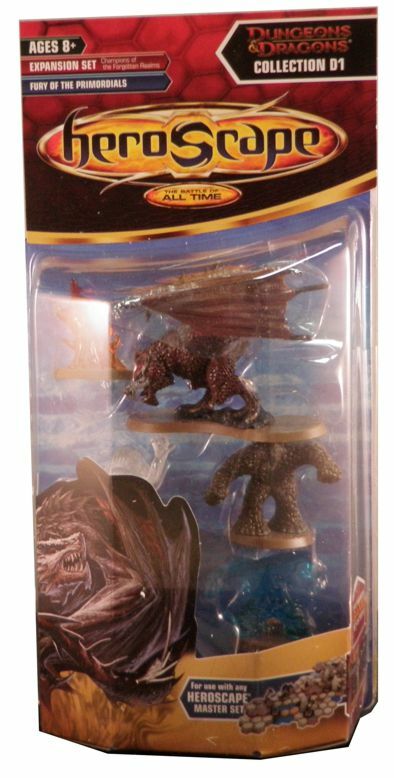 In addition to the three, translucent figures, the set includes an earth elemental figure, and a Wyvern figure, which once appeared in the Aberrations set in a form that now costs about $16 when purchased individually. 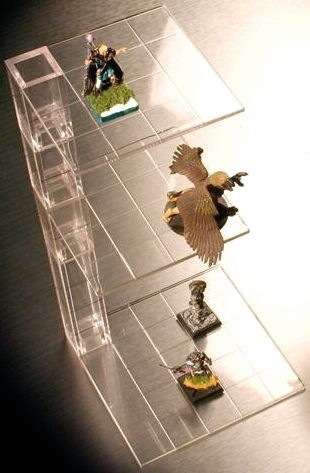 For D&D players, the HeroScape miniatures suffer from oddly-sized bases. The medium bases span a bit more than an inch, making them a bit too big for the squares on the battle map. Large figures like the Wyvern have peanut-shaped bases unsuited to D&D. The Heroscape to DDM re-base guide describes a simple procedure to re-base the figures. Unfortunately, Hasbro dropped the HeroScape line in 2010 and the Fury of Primordials set is long out of print. Most online vendors sell the packs at well above the original retail price, but I managed to find a few still offering the set at a good price. As of this post, some bargains remain available. Also in that my top 11 list, I called out the Lurking Wraith as the best D&D miniature ever, and hoped a painted version would reappear in the Dungeon Command Curse of Undeath set. The set has arrived and, rather than including another version of Lurking Wraith, the set includes a translucent version of the Cursed Spirit renamed the Hypnotic Spirit. I’m happy to have the new figure, but it cannot unseat the Lurking Wraith as my favorite. I prefer the original Lurking Wraith’s shadow gray over the ectoplasmic blue of the Hypnotic Spirit. Plus the enigmatic Lurking Wraith works as a neutral ghostly figure, while the Hypnotic Spirit’s malevolence limits it to being a threat. Nonetheless, if you want to plunder Dungeon Command sets for figures to use in D&D play, the Curse of Undeath set ranks as the best assortment yet. In solving the limitations of battle maps, I looked for better methods of presenting 3D battles. When I posted my question to the EN World and to Wizards’ D&D forums, I received a number of interesting suggestions. The Combat Tiers system from Tinkered Tactics ranks as my favorite. This entry was posted in Dungeon master's tools, Miniatures and tagged battle maps, HeroScape, miniatures. Bookmark the permalink.